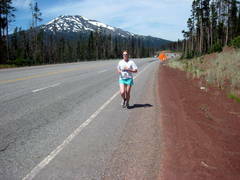 I didn't intend to pause my blogging for the Cascade Lakes Relay - but I am. I planned to put together this coming Friday's Razors Edge and have it magically pop up while I was, again, away from technology (at least the big technology I use to pull the pieces together for my weekly prompt). But the big event itself has taken so much time this past ten days that I didn't get it done and so, there will be a short intermission as I head over to central Oregon tomorrow. I have printed reams of paper (and I'm really not exaggerating: five sets of race guides, five full maps, volunteer packets, directions from Portland to the car rental pick-up to the campground to the start line and so on - then tonight even more: phone lists and car rental reservations and campground reservations). I have bought a heaping cart-load at Winco: mini-bagels, many packages of meats and cheeses, many pounds of bananas and clementines, five pounds of Red Vines and black licorice, and suckers, and raw almonds and five cases of water. And more. I've spent many hours on the phone with insurance compaines and the rental car company and AAA and another supplemental insurance company. And checked red flashing lights for operability, tested the new pesticide sprayers (thanks to a couple of running teams - we learned that these handy inexpensive garden tools make great cooling equipment for runners/walkers in the desert in summer), sorted the supplies into storage boxes for each van. And put out little emotional or excitement or "what if" fires among the team. And the day is here. Tomorrow I will somehow stuff all of the equipment and food that is taking up a chunk of my living room into my compact sedan. My partner will drive me to the meet-up spot, where I will offload everything - including the five cases of water in my trunk - into the RV, in which several of us are making the drive over to the Bend area to pick up the cars and go to our campsite. Oh - did I say that we are camping this year? We have a nice little group campsite right on the edge of a little lake. Should be gorgeous. The RV is small and is for the inactive van's walkers to chill out (literally) if it's hot - but otherwise, we're sleeping in tents. I'm excited. A little anxious - I didn't train as hard as I did last year for this. But I'm also in better general fitness shape than I was. So while I know I will be a little sore and I know my pace will (I want to say "probably" but I know the reality is it *will*) be slower than last year - I will still do it. And I will be okay. I've done some walking, focusing on the downhills since I am again doing the six miles down down down leg (six miles, 1,400 elevation loss). My IT bands will notice my reduced training - but I started taking Arnica on Sunday, along with Ibuprofen, and I saw my chiropractor today who gave me some kinesio tape with instructions. My recovery time from working out aches is really great (on indicator of improved fitness) and I have promised several people I won't overdo it and push myself beyond what is reasonable. So - I know I will be sore and I know I will be slower - but I also know I can do it. How great to be able to say, "three miles? that's easy!" It's been a little hectic and I'm a little low on sleep. So this week's Razor's Edge will wait. Or be skipped. Or you can hop over to YouTube and search for "Cascade Lakes Relay" and pick a video as your inspiration. Pick a character from those on screen (or pick a whole team!) - and tell a story about who they are and how they got to CLR. Friday I'll be on the road with the MissFit WiseWalkers. Making our way from Silver Lake through the Cascade Lakes Highway and on up to Bend.